Our poppers from around 2005. Proper Old Skool! Sussex police seized a batch of poppers in 2017 thinking incorrectly that they were covered by the new blanket ban on legal highs caleld the Psychoactive Substances Act. What are poppers exactly and why were they wrong. Are poppers in fact good for you? Poppers are substances in the group of chemicals known as alkyl nitrites. Originally amyl nitrite was used. Now isopropyl nitrite is the most widely available. 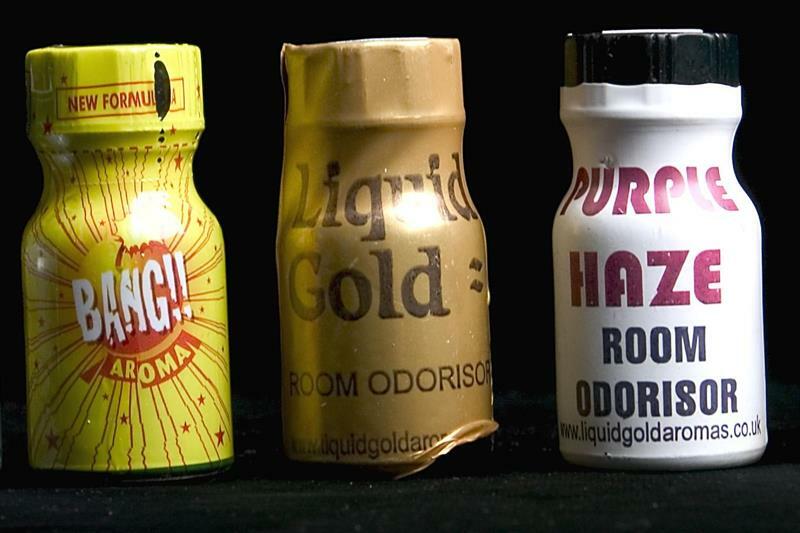 Poppers are usually sold in small bottles, in the form of liquids that produce a vapour that can be inhaled. They open blood vessels, increase blood flow, and frequently reduce blood pressure while increasing heart rate resulting warm sensations and flushed faces and a head-rush. So why are they not a legal high covered by the new law? Tory MP Crispin Blunt said in parliament that banning poppers would be fantastically stupid and outed himself as a user, so the Government got the Advisory Council on the Misuse of Drugs (ACDM) to take a look at poppers. In its first piece of advice on alkyl nitrites, The ACDM suggested that poppers were outside the scope of the ban because it defined a psychoactive effect as having a direct action on the brain. Read the report here. They said popppers had only an indirect effect on the brain, because their direct action was to increase blood flow. So poppers are outside the scope of the ban and are totally legal. So why do people like MPs like poppers? So they were first used to treat angina in the Victorian days because they open up blood vessels. They were (and are) still used an antidote to cyanide poisoning (although we don't think thats the reason Crispin stocks up on them). OK, so what are they widely used for now? And in 2011 the ACMD reported that there were no plans to ban poppers under the Misuse of Drugs Act because their misuse is not seen to be capable of having harmful effects sufficient to cause a social problem. Although if you have heart or blood pressure problems, poppers can be dangerous because of the way they lower blood pressure and increase heart rate. And for similar reasons, it's a bad idea to take them with Viagra. But if you are careful to avoid these risks then there you have it. Poppers are here to stay.